Biography: Dr. Anil Kumar born on January 1, 1973 at a small village Masandgarhi,, in District Mathura, Uttar Pradesh, India is equipped with extraordinary calibre and appreciable academic influence. He is awarded his Ph. D. degree in Applied Mathematics from Dr. B. R. Ambedkar University, Agra with the topic entitled “A Computational Study of Arterial Flows”. 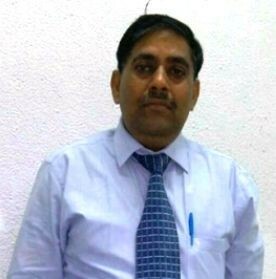 Presently, he is working as Professor in Echelon Institute of Technology Faridabad. He has delivered faculty responsibilities in many esteemed Institutes at Graduate and postgraduate level besides he possesses more than 17 years research experience. His areas of research interests are Bio-mathematical Modeling, Fluid Mechanics, Differential Equations and Numerical Analysis. He is also interested in Mathematical software into the educational and professional environments. In the prestigious National and International Journals, he has published more than sixty research papers which have been extensively appreciated by the eminent personalities in the domain. He has acted as an Organizing Secretary, National Seminar on Mathematical Modeling of Some Physical Systems, on June 13, 2009. In such a short span he has written a more than ten books in which his book on CBNST has widely been acclaimed. He has held many leadership positions with the professional societies in the field. He has attended short term course “Applied Numerical Method’ at IIT R sponsored by AICTE and TEQIP in year 2009. He is also attend ‘Mathematical Analysis and Applications’ organized by Department of Mathematics, Indian Institute of Technology, Roorkee. He is invitation talk more than five in National International conference and also invited talk on “Use of Statistical tool for practical in Real life “ TEQIP II sponsored STC on “Advances of Statistics in Sciences and Engineering” Departments of Mathematics, Physics and Chemistry, National Institute of Technology, Jalandhar, Punjab. He is attend an International Workshop on Computational Intelligence and Applications, Department of Computer Science, South Asian University, Akbar Bhavan, Chanakyapuri, 23 -25 May, 2016.New Delhi, India Dr. Kumar is a Life member of the Operation Research Society of India, Indian Mathematical Society of India, Indian Biomechanics Society, National Academy of Mathematics, Indian society of Mathematics and Mathematical Sciences annual member of the Indian Science Congress and Indian Society of the Technical Education, Indi. He has been selected as a chair person of International conference s on Interdisciplinary Mathematical & Statistical Techniques, University of Science and Technology of China Hefei, Anhui, Shanghai China, IEEE Conference Bharti Vidhya Peeth New Delhi and Elsevier Publication at SRM University Modinagr. International Conference on Sciences , Engineering and Technology Innovations, Sponsored by PTU Jalandhar and INSA New Delhi organized by CT Institute of Technology Jalandhar Punjab. He has foreign visit, attend and presented research paper funded by Department Science and Technology New Delhi India at IEEE Symposium on Business Engineering & Industrial Application, 22?25 Sept. 2013 Kuching (Malaysia). He is a regular reviewer various National and international journals. 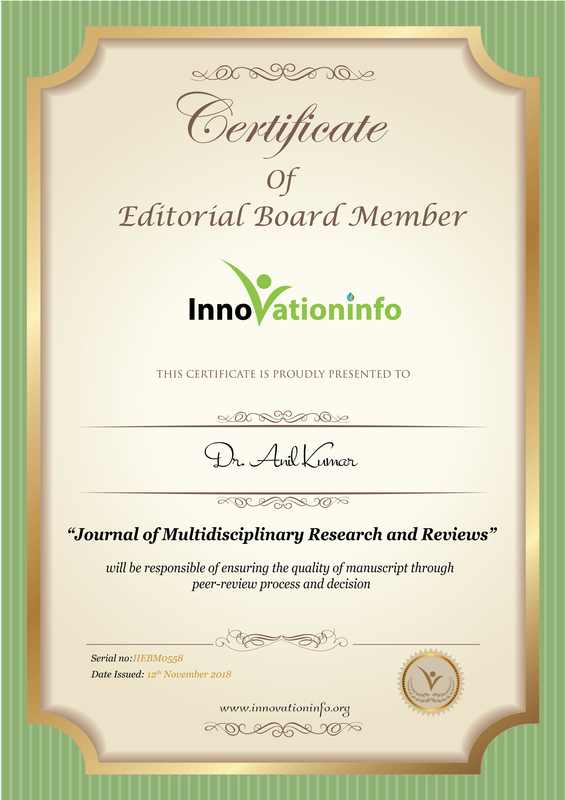 He has appointed as Chief Editor//Editorial board members more than thirty Research Journals. He is Member of Board of Governor of Sai Nath University Ranchi Jharkhand. 1. Anil Kumar (2018) : Finite element technique for two dimensional MHD stagnation-point flow in the presence porous medium , UPI Journal of Mathematics and Biostatistics ISSN 2381-4672, vol. 1(1), 68-75. 2. Anil Kumar and G C Sharma (2017):Performance and Analysis of Flow between Annular Space Surrounded by a Rotating Coaxial cylinder with Co-axial Cylindrical Porous Medium, International Journal of Scientific Research in Computer Science and Engineering, , vol. 5(3) pp 1-6 ISSN: 2320-7639. 3. Anil Kumar and S P Agrawal (2017): Mathematical study on the MHD Squeeze Flow between Two Parallel Disks with Suction or Injection via HAM and HPM and Its Applications, International Journal of Engineering Trends & Technology (IJETT), ISSN: 2231-5381. Vol. 45(1) pp 27-32 2017. 4. Anil Kumar : Mathematical Modeling and Analysis of Blood Flow through Artery of Varying Cross section area and its Applications, 2017, Vol. 5, No. 1, 1-4. Biomedical Science and Engineering Biomedical Science and Engineering, ISSN (Print): 2373-1257 USA. 5. Anil Kumar : Matehmatical Study of Thermosolutal convection in Heterogeneous Vscoelastic Fluid in the Presence of Porous Medium, Vol 5(1) pp 12-16, 2017, American Journal of Mathematical Analysis, ISSN (Print): 2333-8490 ISSN (Online): 2333-8431. 6. J. P. Singh, Anil Agrawal, V Upadhayay and Anil Kumar (2015): Mathematical Model and Analysis of Two Phase Hepatic Blood Flow through Arterioles with the Special Reference of Hepatitis A, American Journal of Modeling and Optimization, USA, Vol. 3, No. 1, 22-25. ISSN (Print): 2333-1143 ISSN (Online): 2333-1267. 7. Pawan Preet Kaur, SP Agrawal and Anil Kumar (2014): Analysis of heat transfer in hydro magnetic rotating flow of viscous fluid through a non homogenious porous medium with constant heat source/sink, International Journal of Engineering Research & Industrial Applications, India vol. 7 no. 1 pp 9-24. ISSN 0974-1518. 8. Pawan Preet Kaur, SP Agrawal and Anil Kumar (2014): Analytical Study of MHD on Laminar Mixed Connvection of Newtonian Fluid betweeen Vertical parallel Plates through Channel, Intenational Journal of Multidisplinary Research and Advanced in Engineering , India Vol. 6(1) pp 85-98. ISSN 0975-7074. 9. Pawan Preet Kaur, SP Agrawal and Anil Kumar (2013): Finite Difference Technique for Unsteady MHD Periodic Flow of Viscous Fluid through a Planer Channel, American Journal of Modeling and Optimization, USA, Vol. 1, No. 3, 47-55. ISSN (Print): 2333-1143 ISSN (Online): 2333-1267. 11. Anil Kumar, CL Varshney and Sajjan Lal (2013): Perturbation technique of MHD free convective flow through infinite vertical porous plate with constant heat flux, International Journal of Mathematical Modeling and Physical Sciences, India Vol. 01, (02) pp 1-5, June 2013. ISSN 2320-9992. 16. Anil Kumar and Janamejay Singh (2013): Galerkin’s Solution of two dimensional MHD forward stagnation point flow in the presence of hall current with porous medium, International Journal of Mechanical Engineering Research , India vol. 3(3), pp 162-167. ISSN 2249-0019. 17. Anil Kumar, CL Varshney and VP Singh (2013): Mathematical Analysis of blood flow through porous effects, International Journal of Mechanical Engineering Research, India vol. 3(2), pp 149-155. ISSN 2249-0019. 20. Anil Kumar Gupta (2012): Computational study of blood flow through stenosed artery with magnetic effects, International Journal of Information and Computation Technology, India vol. 2(1) pp 81-84. ISSN 0974-2239. 21. J. Singh and Anil Kumar Gupta (2012): Computational study of porous medium on flow of non Newtonian liquid, International Journal of Information and Computation Technology, India vol. 2(2) pp 235-236. ISSN 0974-2239. 22. Varun Mohan, V Prasad, N K Varshney and Anil Kumar Gupta (2012): Computational study of porous medium effect on oscillatory arterial blood flow with mild stenosis, International Journal of Information and Computation Technology, India vol. 2(2) pp 231-233. ISSN 0974-2239. 23. Anil Kumar, CL Varshney and Sajjan Lal (2012): Finite element Galerkin’s approach to MHD viscous incompressible fluid flow through a porous medium in coaxial cylinders, International Journal of Information and Computation Technology, India vol. 2(2) pp 241-245. ISSN 0974-2239. 24. Anil Kumar, CL Varshney and VP Singh (2012): Computational study of blood flow in a circular tube of varying cross- section with porous effects, International Journal of Information and Computation Technology, India vol. 2(2) pp 247-250. ISSN 0974-2239. 26. Anil Kumar : Finite element method of non Newtonian behavior of blood on pulsatile flows in stenosed arteries with magnetic effects, International Journal of Environmental Engineering and Management, India, vol. 3(1) 2012. pp 29-32, ISSN 2231-1319. 32. Anil Kumar, CL Varshney and Sajjan Lal: MHD free convective fluctuating flow through a porous effect with variable permeability Parameter, International Journal of Engineering, Iran, Volume 23 - 3&4 - Transactions A: Basics, ISSN 1025-2495 November 2010, pp. 313-322 2010. 36. Anil Kumar, CL Varshney and Sajjan Lal: Analytical study of effect of disorder on dispersion in steady inertial flows in porous effect, International Journal of Scientific Research and Essays, ISSN: 1992-2248 DOI: 10.5897/SR South Africa Vol.4 (11), pp. 1392-1402, 2009. 39. Anil Kumar and Narendra Kumar: Performance for Mathematical model of DNA supercoil, International Journal of Bio-Sciences Research Bulletin, India vol. 22 (2), 79-87, 2006. ISSN 0970-0889.